Show Rules - Raise The Roof Live! 2. Class limits: 3 models per class. You may enter extra horses in a class for $1 each. 4. For a model to be judged for collectability, collectability information must be presented including year(s) produced, number produced, and for which event, store, etc. Any explanation concerning variation, rarity, etc is also helpful. A model without collectability information will NOT be judged for collectability. 5. Regular Run Breyer refers to any model available through a Breyer Retailer including Christmas or Halloween horses, mid-year releases, Brick-and-Mortar exclusives, glossy variations distributed randomly to retailers, Treasure Hunt prize models, and limited runs available only through Breyer Retailers. 7. If a model is found to be showing in an incorrect division, its owner will be asked to move the model into the correct division. 8. “Foal” refers to an equid under 2 years. 9. Always ask permission before handling another exhibitor’s models. If you damage another’s model, you are responsible. 10. No running in the show hall. 11. Do not write on the show ring tables. If you need to fill out a tag, NAN card, or placing card, please do so at your table, on the floor, or walls. 12. If a model is laid down in the ring, judges assume permission to pick it up to examine the off-side. 13. Please, be respectful of the judges while classes are being judged. 14. Models may be shown in only one breed class. 19. Tags must be used to identify models. The model’s name and your 3 initials must be on the back, the model’s assigned breed and gender must be on the front. When placing your model in the ring, please ensure the breed/gender side is up. If the initials/name side is up, the model may not be judged. 20. 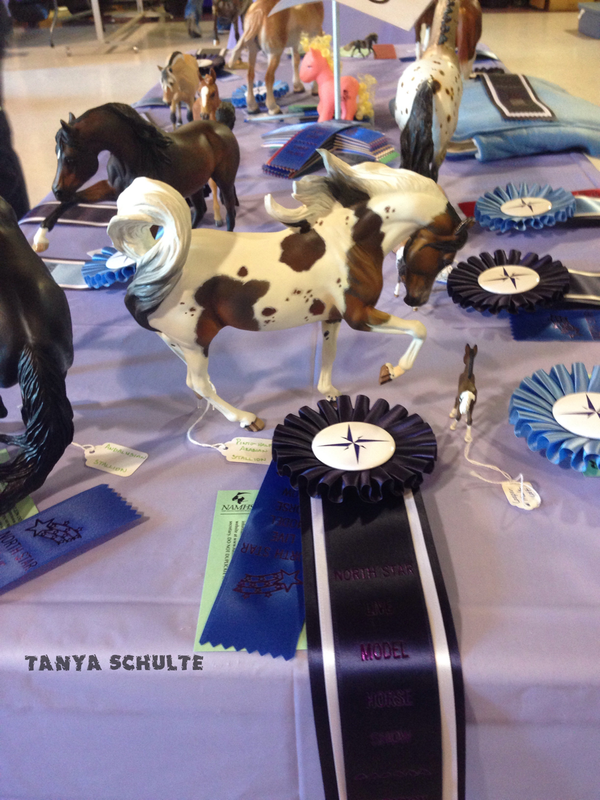 Paper ribbons/cards will be awarded for 1-4th place in breed and collectability in halter. 1st & 2nd place equids will receive a NAN card in all qualifying NAMHSA classes. These cards will qualify the model receiving it to be shown at NAN 2018-2021 in its respective class. Placings will be recorded for 1st-3rd place. Ribbons will be awarded for sectional champions and reserve champions. Fleece Pony Pouches will be awarded for division champions. 21. Breed documentation is encouraged for rare breeds and unusual crosses. Please keep documentation to no more than one 8.5” x 11” sheet. 23. The overall grand champion of each division will be eligible to compete for Best in Show. Best in Show will be judged by the show entrants! Each shower will receive a ticket to place in a cup next to the entrant they want to vote for. The horse that received the most tickets wins. Clarification of divisions: Though they show with the same class list, Regular Run Breyers are a separate division from Special Run Breyers, as well as Peter Stone is its own special division (PS will not show with Breyers). Also, Custom models and Artist resins are their own separate divisions. However, Mini AR/CM are a single division. China will have OF China show separately from CM China. YES, I am accepting raffle donations! You MUST have collectability information for a model to be judged in collectability. Only models that are realistic in color will be judged in halter classes. i.e. if you have a gold charm appaloosa Lady Phase, she would be judged in the appaloosa class for collectability only, not for breed. If you have a bay QH with no collectability information, it will be judged in breed only but not collectability. If you have a chestnut arabian with collectability information, it will be judged in both breed and collectability.